Benchmark Australian ore, with a 62% iron content, dropped 70 cents to $88.20 a tonne, according to The Steel Index, bringing the losses since the middle of the month to 5.6%. So far this year the commodity has dropped 35% due to a surge in supply and a slowdown in China, which consumes more than two-thirds of the 1.2 billion seaborne trade. After reaching a high of $158.90 in February, the industry was jolted on March 10, when iron ore suffered the worst one-day decline since the 2008-2009 financial crisis, cratering 8.3% in a single session. The recovery from there was swift, but by June this year it was sliding again, hitting a low of $89 a tonne. Iron ore prices slowly clawed back some of those losses for a 2% gain in July breaking a six-month losing streak. But August has brought renewed selling, and the commodity fell yesterday to the lowest since September 5, 2012. The steel-making raw material is vital to the profitability of many of the world’s largest miners, such as BHP Billiton, Rio Tinto, Anglo American and Vale. They are spending billions of dollars ramping up output to meet anticipated future demand, and capture market share, while pushing the global market into surplus. 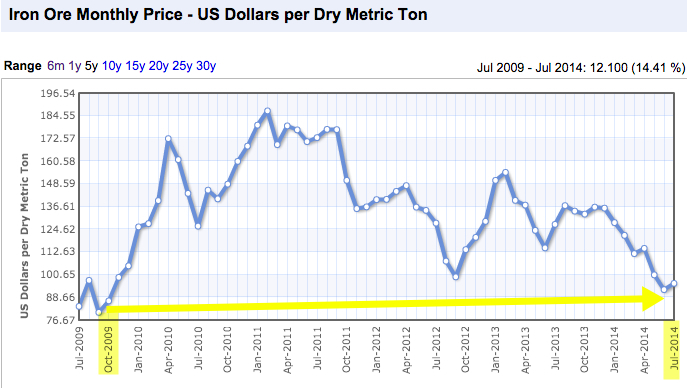 If the commodity loses another $2 a tonne, it will be the lowest price since October 2009.